Omaha artist Kristin Pluhacek has a Secret Garden. No, It’s not an unknown, unseen plot of annual or perennial “city flowers.” Nor is it a hidden cache of her popular botanical drawings that have made Pluhacek one of the most popular visual artists in the Metro. Her “secret” is a hothouse group of figure drawings that are hardly of the garden variety. They, along with a set of her more familiar city flowers, pods and seeds are currently on display through Mar. 9 in the Garden of the Zodiac Gallery in the Old Market Passageway. Despite their different subject matter, Pluhacek said in a recent interview that all the works seen in this exhibit sponsored by the Moving Gallery share a similar aesthetic and sensibility. Given Pluhacek’s background as a drawing instructor at Metro Community College, it’s no surprise that her disciplined regimen, as well as powers of observation, inform all her drawings regardless of medium and subject. Add to that a distinct sense of being and creating in the moment, one shared by artist and audience. True to this code, she continues to spend time drawing on site a few days a week during the exhibition, putting into practice what she teaches and what she has learned, and practices even more. “Design” is the operative word here as its principles of balance, emphasis, proportion and unity in particular, inform all her work, flora and figure alike. It’s this attention to detail and one thing more that raises the former above the merely decorative and the latter beyond an academic exercise. In this exhibit, what’s readily apparent is that botanicals and figures are paradoxically studies and portraits, as they share Pluhacek’s aesthetic of intricate design, grand gestural mark-making and bold, expressive palette. Her figure drawings are the real surprise here, but it’s her city flowers and more that continue to build a following. Her series of four “Hydrangea” pastels may be the best example of what distinguishes Pluhacek from other artists who create in the same genre. As striking as her sunflowers, irises and tulips are with their vibrant color and seemingly effortless representation, it’s her Hydrangea’s that raise the bar. This grouping, along with her pods and seed renderings, transform ordinary botanical drawings into sophisticated abstractions of form, color, line and movement. Pluhacek’s more minimal studies manage to deconstruct the essence of all things flora into moments of pure sensual pleasure. But just as Whistler famously categorized his work as “arrangements,” “nocturnes,” “harmonies,” and “symphonies,” so could Pluhacek’s studies be similarly titled as they too emphasize key elements of drawing and design, not to mention the senses of touch and smell. 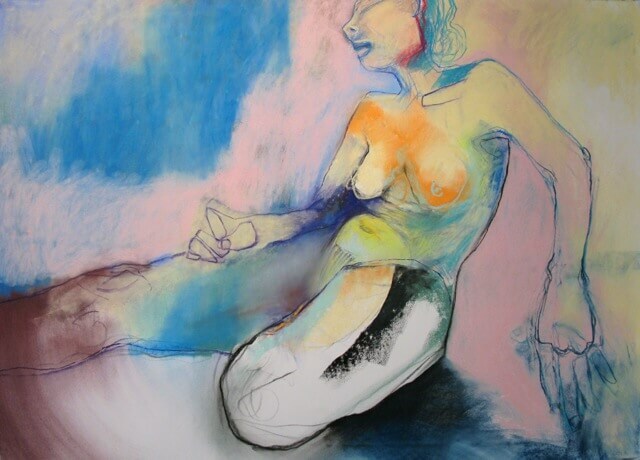 Yet, while the artist believes her figure drawings have that same studied detachment, careful viewer attention reveals not only a similar style but also a more personal tone and point of view consistent with her technique and process. That in itself is no secret. Perhaps what her figures reveal most is that while her botanicals are light, airy, even joyful, the former are moodier and mostly disengaged from the viewer. Whatever these drawings say about her emotionally, Pluhacek remains true to her artistry as her figures are unified in a way that eludes many others working in the same mode. It’s one thing to document a mood in the visage of a subject. Quite another to observe that the same emotion is reflected in one’s body language and then capture and render this connection in an evocative design that unifies all three. For example, on the north wall of the Zodiac’s main gallery, there is an interesting study in contrast with three separate drawings. In “F,” a woman’s angst is reinforced by her sagging breasts and shoulders and dark brow all rendered in rough patches and irregular, unfinished lines. The figure is unraveling literally and figuratively before our very eyes. Compare that with her opposite, “Georgetta,” a portrait of quiet before the storm, so to speak, whose bosom seems to well up in passionate orange—her face nearly flush with it all. While reclined she braces herself with one hand, her trunk bathed in a cold shadow. Oblivious of the viewer, Georgetta appears on the brink of some extreme decision or action. Not so with the regal, nearly arrogant “Sanford,” defying the viewer with nose upturned, lips curled, and muscular pose. Sanford’s mass and lines are more sculptural than drawn and the image’s vibrant palette rages more than radiates. Two additional favorites in the gallery are another study in contrasting tone and design. One is simply titled “Figure Study” (One wishes for less understatement) and the other is called “Alan,” presumably the name of the model. The first is in pastel, exclusively, the second includes charcoal in the mix. Ironically, “Figure Study,” a female to be sure, is less of a study and may be the most finished piece in the exhibit, due in no small part to its more painterly style. The design is less reliant on line and more on colorfully nuanced shading and contouring to create character and mood. This is a beautifully expressive work, asymmetrically balanced in shades of red (her tortured torso) and preternatural green (her aggrieved face and soul). There is no escape at the top of the cramped frame for what ails her, but neither can the bottom contain whatever passion consumes her as her torso spills over the frame in this head vs. heart composition. Lastly, we have the aloof, diffident “Alan” sitting conveniently away from the viewer. A cool blue dominates this minimalistic image, as the subject seems almost surprised that anyone would care enough to disturb his space. So neutral is he that the artist is careful to compose him symmetrically, and unlike others in this “garden,” she keeps him at a distance, man-spread and non-committal. It’s not that he has anything to hide. “Alan” is a virtual study in the fine art of Pluhacek’s mark making. That’s no secret to those already familiar with her oeuvre. Now add to that pleasure, a relatively unknown garden of delights, figuratively speaking. Kristin Pluhacek: Drawings continues through Mar. 9 at the Garden of the Zodiac Gallery in the Old Market Passageway, 1054 Howard St. For details, call 341-1877.